More Americans are giving President Barack Obama a thumbs-up. In fact, the president’s approval rating climbed to 46.4 percent in the first three months of 2015—a 3-percentage-point increase from the previous quarter, USA Today reports. It was his best quarter since mid-2013, according to the Gallup poll. A separate CNN/ORC survey (pdf) found a similar trend. CNN reports that 48 percent of Americans approve of how Obama is running the country, while 47 percent disapprove. It’s the first time since May 2013 that more Americans approve than disapprove of Obama. Both polls point to the economy as the primary reason for the upward trend. Falling gas prices at the end of 2014 helped people keep more money in their pockets. CNN said that more Americans are feeling positive about their personal finances. Forty-two percent of those polled said they’re better off financially than they were one year ago. If this trend continues, Obama could soon pass the elusive 50 percent mark. 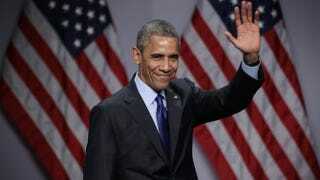 USA Today notes that the average presidential approval rating since 1945 is 53.3 percent. The last time Obama’s approval rating was that high was in the period leading up to his re-election victory and his second inauguration. When put in perspective, Obama’s numbers are nestled between those of his immediate predecessors, according to CNN. President George W. Bush had a 36 percent approval rate at the same point in his presidency, while President Bill Clinton reached the 60 percent mark.